Hana Modz has once again upped their game with the new Hana Modz Pack 3 featuring a new DNA 40 temperature protected chip. Hana Modz made quite an impression with their first two powered box mods, and this new version is extremely impressive with some new features that until now we haven’t seen on regulated mods. The heart of the device is the new 40 watt chip from Evolv. This is where this mod gets really interesting because its boasts several features we haven’t seen. Aside from the basic wattage control and battery protection (there was no battery protection in the DNA 20 or DNA 30), Evolv have introduced temperature protection, preheating functionality and synchronous rectification. Temperature Control is a special mode that you can run the DNA40 in. It allows the chip to measure the exact temperature of the coil in the RDA and prevent burning or overheating. This is really nice. If you’ve ever had dry hits on a rebuildable atomizer, you know that burnt taste. Ever fried your cotton wick? Temperature control prevents all of this. IMPORTANT NOTE: The Temperature Control mode only works with Nickel 200 Alloy wire. This is also known as non-resistance wire. You can find this at your local vape shop or online here. Non-resistance has been a special use wire, but has fallen in popularity for resistance vaping with wire types such as Kanthal or Nickel Chromium alloys. Non-resistance wire was used on devices such as the Penelope, Ody and Ithaca if you go that far back. Now its been brought back for the DNA 40. Temperature Control will only work with non-resistance wire. Temperature control allows you to dial in your desired temperature – anywhere from 200-600 degrees. You dial it up and down just like you would wattage or voltage – this is impressive! So what’s actually happening is that the chip is constantly reading the temperature. It keeps this consistent by dynamically controlling the wattage. It will back off to keep it where you set it. This will keep you from ever burning the cotton – really cool. This is cool too. If you’re using Nickel 200 wire and you’re in temperature control mode, the chip keeps the coil warm, but below boiling. The idea here is to shorten the amount of time the vapor takes to heat up as you start to vape. Very nice touch. You also get all of the standard user modes on the DNA40 including: Locked mode, Stealth mode, Right and Left display flip, Power lock mode (to prevent up and down buttons from changing the wattage when in your pocket) and Max temperature adjust (when in temperature control mode). 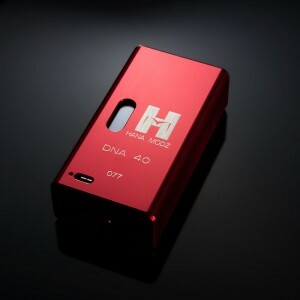 Is the Hana Modz DNA 40 Worth the Money? In short? Absolutely. The DNA 40 chip is outstanding and packs a lot of features that you’re not going to find on any other regulated mod. And these features are enormously useful. Granted most of the cool stuff is wrapped up in the temperature control feature that will require Nickel 200 wire to use. You can run the device in regular mode as well, but you don’t get the newer features. This means that if you have other mods, you’ll probably need to dedicate a specific RDA just for the Hana, but I think its totally worth it! i’m thinking of investing in the new chip set in a device, just not sure of a few things…this was informative. Hi I recently bought one of your products, and was wondering if it is safe to use kanthal in temperature control mode? ?